The view is taken from the old London Road (subsequently the A3 trunk Road). Stroud is a small village 1½ miles to the west of Petersfield in Hampshire, and on the Hampshire and West Sussex border. Abraham Pether was born at Chichester, where he was a pupil of George Smith, one of the three brother landscapists of that town in the mid-18th century. He derived much of his early style from Smith, whose influence is discernible until the late 1790’s, but he also progressed his art by a careful observation of the romanticism of Richard Wilson RA.. 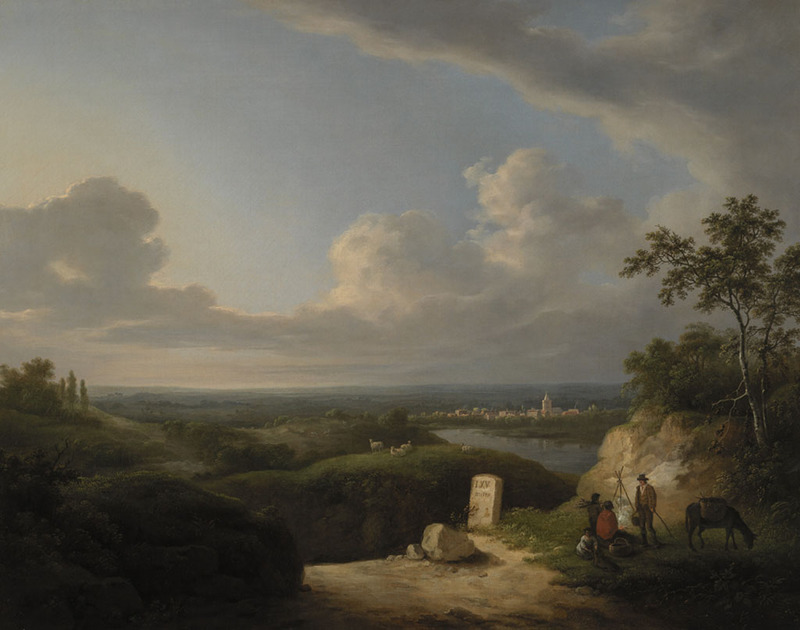 The present painting numbers amongst the topographical views of his own county which he painted on numerous peregrinations from Chichester in 1770's and 1780's. He later travelled through the north of England and painted numerous views in Yorkshire. From at least 1784 he developed an increasing interest in the painting of crepuscular and night scenes, to the extent he was christened with the sobriquet “Moonlight Pether”. His son Sebastian (1790-1844) and grandson Henry (fl.1828-1865) continued the family tradition of nocturnal scenes, but neither approached him for quality of execution. His cousin was the distinguished engraver William Pether (b. Carlisle 1738; d Bristol 1821). Pether was also renowned for his interest in the empirical sciences, and experimented in the novel field of electricity as well as astronomy.